This post is a development of a couple of Twitter posts as part of this fruitful exchange, initiated by John H.
For most of the Divine Service, there are two ways liturgists can face. Ad orientem means ‘towards the east’, and refers to the liturgist facing the altar, with his back to the congregation. The opposite way is versus populum, facing the people, with his back to the altar. The rationale for these is simple: when the liturgist addresses God with or for the people (chiefly in the confession and in the prayers), he faces the same way as the people, and towards God, whose presence the altar symbolises. When the liturgist addresses God’s word(s) to the people (e.g. in the absolution, in the readings), he faces the people whom he addresses. Because it’s polite to face whomever you address. And it doesn’t make sense to do otherwise. So which way should the liturgist face during the liturgy of the sacrament? Some of that liturgy is addressed to the people (the Preface), some to God (the Proper Preface and eucharistic prayers, the Lord’s Prayer, the Sanctus & Benedictus, the Agnus Dei). Easy enough. But what about the Words of Institution? Who are they addressed to? If they are embedded in the eucharistic prayer, as they are in many traditions, they are addressed to God. Simple. And if they were addressed to the people, as a sort of additional Gospel reading accompanying the celebration of the sacrament, versus populum would make sense. 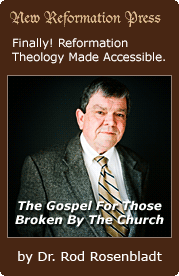 But in Lutheran theology at least, they are not addressed to the people. They are the Words of Institution—not merely the historical institution of the sacrament in general, but the institution of the sacrament there and then. The words do what they say, that is they bring about the sacramental union of the body and blood of the Lord with the bread and the wine. In other words, the Words of Institution are addressed to the elements. And this is not unimportant or merely technical. The Sacrament is the Gospel: it is where the word ceases to be information for the ears and becomes a tangible reality. It is where the crucified and risen body of Jesus, which is the Temple of God on earth, meets with our mortal bodies as the medicine of immortality. And therefore the Words of Institution are the Gospel precisely when the congregation eavesdrops on them, hearing them pronounced over the elements for their good. As long as they are addressed to the people, they remain historical information without direct contemporary relevance or benefit. And this, to my mind, is a key argument against the increasingly common, and historically pretty unheard-of, practice of versus populum celebration of the Sacrament in the modern style: with the celebrant positioned behind a free-standing altar, facing the people over the altar. It removes the priest from the people, and it turns the congregation into an audience being addressed, as if God were declaring the Words of Institution to the people as well as the elements. Now it’s true that Luther suggested that the consecration should be done versus populum, although he never did anything about it. I used to share his argument. In fact, one of my very few printed publications makes that case. And so when I say that I disagree with Luther on this point, I also disagree with myself. Which I hope makes it OK. Anyway, as it happens, Luther did nothing about it, and neither did any other Lutherans. Not until Vatican II anyway, when Rome introduced free-standing altars and versus populum celebration for entirely different and rather un-Lutheran reasons: better to include the people in the sacrifice with the people. It makes poor sense in Roman Catholic theology, as my good friend and Roman Catholic priest tells me, and it doesn’t make any better sense in Lutheranism. And it’s pretty ironic that we should be aping Vatican II practices at all, given that they are solutions to problems for which we had much better solutions in the 1500s. Because what Luther did do was to break the silence over the Words of Institution. 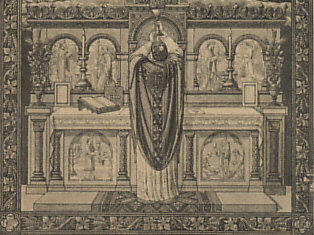 In the mediæval Canon of the Mass (and after Trent as well), the Words of Institution were said silently by the priest. Luther had them not merely spoken aloud, but chanted to the Gospel tone! And by this radical yet simple device, Luther turned the Words of Institution into the Gospel they are in the most effective possible way. No need for the pastor to face awkwardly towards the congregation, no need for re-ordering churches. No need to break with catholic tradition that pre-dates the corruption of the Mass in the Middle Ages, just to make the point, which hadn’t been lost anyway. 1. Rome’s reasons for having a free-standing altar need not be our reasons. They do a pretty good job of interpreting both directions (versus populum and ad orientem) in a sacrificial manner. Luther’s interest was different. How can we best portray the presence of Christ as the presider? 3. The fact that the Verba are directed primarily at the elements doesn’t answer the question of orientation. They can be directed at the elements from either position. But the versus populum position does a better job (I think) of conveying the fact that at that moment the pastor does not represent the people, but represents Christ. 4. With this said, I have no interest in the “stripping of the altars”, tearing out beautifal traditional altars and replacing them with tables just so you can celebrate versus populum. But where the opportunity presents itself, I will choose versus populum every time. Thank you Tapani for your discussion and thoughts on this. Also thank you Professor Winger for your addition comments especially points 3. AND 4. At the moment in our little chapel in Nairobi, Kenya my position is Ad oriented but I do feel awkward at times. One reason is because I do lift the host and the cup so the laity, especially the children, can see what is in my hands and that I am not doing hocus-pocus, at least not in the Roman way! When I do this I fear confusing the people with impression that I am following the Catholic practice of “resacrificing” Christ. I feel more comfortable positioning myself versus populum because the words of institution consecrate the elements but they ALSO declare the Gospel to the people and this point is reinforced at the conclusion of the consecration when the pastor declares, “The peace of the Lord be with you always” and the congregation replies “Amen”, not “And also with you” unless there is going to be a passing of the peace which is possible but rarely happens at that point.